Analysis: Beckham was a sporadic attendee of the Giants' offseason program the past two years, so his current absence has precedence. By all indications, he'll make his presence felt at OTAs throughout May and mandatory minicamp from June 4-6 to build his rapport with Baker Mayfield and company. Beckham has yet to address the quadriceps injury that forced four consecutive DNPs to conclude last season, but the aforementioned activities eventually will put an end to any questions about his health. Analysis: Beckham had been rumored to be in trade talks, and the Giants and Browns now have a deal in place. He'll undoubtedly be the top pass-catcher on the offense alongside Jarvis Landry. The blockbuster deal will increase the fantasy value of quarterback Baker Mayfield and could make life easier for running backs Nick Chubb and Duke Johnson. Beckham is coming off a 2018 season that saw him record 77 receptions for 1,052 yards and six touchdowns in 12 games. 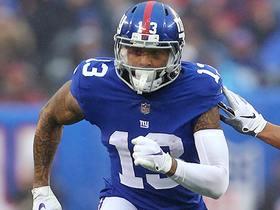 Analysis: While the Giants may be willing to listen to offers, it's a long shot for Beckham to actually be traded after he signed a five-year, $90 million contract extension in August. He should be healthy for the start of the Giants' offseason program despite missing the final four games of the 2018 campaign with the quad injury. Beckham (quadriceps) isn't expected to play Week 17 against the Cowboys as he was on the side without a helmet at practice Friday, Jordan Raanan of ESPN.com reports. Beckham (quadriceps) was held out of Thursday's practice, Jordan Raanan of ESPN.com reports. 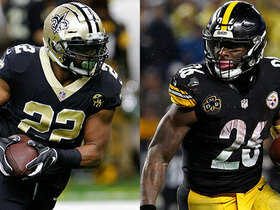 Analysis: After back-to-back DNPs to open Week 17 prep, Beckham seems more likely than not to miss a fourth game in a row to wrap up the 2018 campaign. The Giants may confirm as much well before the release of inactives for the season finale, as they've done with Beckham for each of the past three contests. With Russell Shepard (ankle) also trending in the wrong direction, the trio of Sterling Shepard (hip), Evan Engram and Saquon Barkley can prepare for a healthy dose of targets yet again. Head coach Pat Shurmur does not expect Beckham (quad) to participate in Thursday's practice, Jordan Raanan of ESPN.com reports. Coach Pat Shurmur said Beckham (quadriceps) isn't expected to practice Wednesday, Jordan Raanan of ESPN.com reports. Beckham (quad) has been ruled out for Sunday's game against the Colts, Jordan Raanan of ESPN.com reports. Analysis: Beckham was unable to practice at all this week and will sit out a third straight game as a result. With the Giants out of playoff contention and just one game remaining on the schedule, it's certainly possible that fantasy players have seen the last of Beckham in 2018. Sterling Shepard will once again rank as the clear-cut top option at wideout for the Giants in Week 16, but it's tough to predict how much volume the other New York receivers might earn. Beckham (quadriceps) didn't participate in the portion of Friday's practice open to the media, Jordan Raanan of ESPN.com reports. Analysis: Beckham hasn't practiced since Dec. 12 and was instead limited to working out on the side on a stationary bike Friday. With no on-field reps ahead of Sunday's game against the Colts, it seems rather unlikely that Beckham will gain clearance to play. The Giants will provide official word on Beckham's status for the Week 16 contest shortly after practice concludes. Beckham said Thursday he's going "day by day" with his quadriceps injury and will suit up "if his body cooperates," Jordan Raanan of ESPN.com reports. Beckham (quadriceps) wasn't participating in the portion of Thursday's practice that was available to the media, Art Stapleton of The Bergen Record reports. Coach Pat Shurmur said Beckham (quadriceps) wouldn't practice Wednesday, Jordan Raanan of ESPN.com reports. Coach Pat Shurmur said he isn't considering the idea of shutting Beckham (quad) down for the rest of the season, Ralph Vacchiano of SportsNet New York reports. 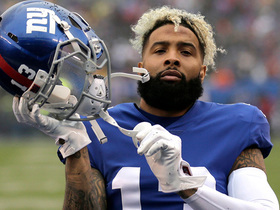 Analysis: Elimination from playoff contention means the Giants probably won't push Beckham too hard if he's still hurting, but the team does have some hope he can get healthy in time for a Week 16 game at Indianapolis, per Jordan Raanan of ESPN.com. Coming off back-to-back absences, the superstar wideout probably needs to log a full practice before he's cleared to play in a game. The Giants will release their initial Week 16 injury report Wednesday afternoon. Beckham (quad) has been ruled out for Sunday's game against the Titans, Jordan Raanan of ESPN.com reports. Beckham (quad) was not spotted at Friday's practice, Art Stapleton of The Record reports. Analysis: Beckham is apparently at the Giants' facility Friday, but he was not on the field during the portion of practice open to the media. He could still get some work in behind the scenes, but it's looking like he will sit out practice for the second day in a row, which does not bode well for his chances of playing Week 15. Beckham (quadriceps) was a non-participant at Thursday's practice. Speaking of his Week 15 availability, he said, "I won't know until Sunday gets here. I'm feeling better every day." Analysis: Instead, Beckham had an outside evaluation on his quadriceps in which his current status was compared with baseline tests for when he suffered the initial injury, per Art Stapleton of The Bergen Record. It remains to be seen if Beckham will be listed as limited Friday (as he was Wednesday) or encouragingly upgrades to full participation. No matter what comes to pass, his status for Sunday against the Titans may be headed toward a game-time decision. Head coach Pat Shurmur said Beckham (quadriceps) will not practice Thursday while he goes for outside evaluation, Dan Duggan of The Athletic reports. Analysis: Beckham was listed as a limited participant in Wednesday's practice after being involved in the walk-through, stretching and some individual drills, but now it looks like the Giants want another opinion on his bruised quad in an effort to avoid having their top receiver sidelined for a second straight week. Beckham will likely need to take part in a full practice Friday in order to be available for Sunday's matchup against the Titans. Beckham (quadriceps) is listed as a limited participant on Wednesday's practice report, Art Stapleton of The Bergen Record reports. Beckham (quadriceps) took part in team stretches and some individual drills before working on the side with trainers at Wednesday's practice, Tom Rock of Newsday reports. Analysis: The activity comes on the heels of coach Pat Shurmur telling Jordan Raanan of ESPN.com that Beckham wouldn't practice Wednesday due to a lingering quad bruise. Beckham also participated in the morning walk-through, so there seems to be a chance he'll be listed as a limited participant. If Shurmur's prediction comes to pass, though, Beckham will have two more chances to make an impression at practice this week. Coach Pat Shurmur said that Beckham (quadriceps) won't practice Wednesday but is "getting better" and on an upward trend heading into the Week 15 matchup with the Titans, Jordan Raanan of ESPN.com reports. Coach Pat Shurmur said Beckham (quad) is feeling better Monday, Art Stapleton of The Bergen Record reports. Beckham (quadriceps) will not play Sunday against the Redskins. Analysis: It's a surprising turnaround given Beckham was listed as a limited participant Friday, but he didn't carry an injury designation prior to Saturday's announcement. 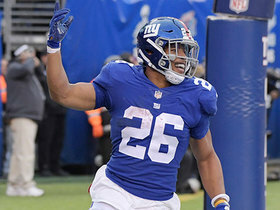 Sterling Shepard will immediately step in as the primary receiving option outside of running back Saquon Barkley, but the likes of Bennie Fowler and Russell Shepard should also see a significant increase in snaps against a Redskins defense that has allowed the third-most fantasy points to the wide receiver position in 2018. Beckham was limited in Friday's practice due to a bruised quadriceps but won't carry an injury designation into Sunday's game against the Redskins, Art Stapleton of The Bergen Record reports. Beckham brought in three of nine targets for 35 yards and a touchdown and also threw a 49-yard touchdown pass to Russell Shepard on a trick play in the Giants' 30-27 overtime win over the Bears on Sunday. Beckham caught five of nine targets for 85 yards during Sunday's 25-22 loss to the Eagles. Analysis: Beckham got off to a quick start, recording 63 yards on three catches before halftime. He needed an IV at halftime, according to Jordan Raanan of ESPN.com, and slowed down considerably after returning, but some poor throws from Eli Manning and questionable officiating played a part in that. Still, Beckham hauled in his most passes since Week 8 and surpassed 70 receiving yards for the fifth straight game. He'll look to get back into the end zone in Week 13 against the Bears. Beckham brought in all four of his targets for 74 yards and a touchdown in the Giants' 38-35 win over the Buccaneers on Sunday. He also rushed once for 11 yards. Beckham caught four of 11 targets for 73 yards and two touchdowns in Monday night's 27-23 win over the 49ers. Beckham caught eight of 11 targets for 136 yards during Sunday's 20-13 loss to the Redskins. Analysis: Beckham led the team in targets and catches as he totaled his second-best receiving output of the season. He broke off a long gain of 44 yards, averaging a healthy 17 yards per reception. Perhaps the only complaint Beckham's fantasy owners may have is that he failed to reach the end zone again and has just two touchdowns despite already hauling in 61 passes. He'll rest up during the bye week before taking on the 49ers in Week 10. Beckham caught eight of 11 targets for 143 yards and a touchdown in Monday night's 23-20 loss to the Falcons. Beckham caught six of his 10 targets for 44 yards in Thursday's 34-13 loss to the Eagles. Analysis: Beckham once again hauled in some poorly thrown Eli Manning passes and broke tackles after the catch to gain extra yardage, but it was all short stuff as the Giants are not looking down the field very often. Beckham should bounce back, but Manning's play is a drag on his production. Beckham caught eight of 14 targets for 131 yards and a touchdown Sunday against the Panthers. He also threw a 57-yard touchdown pass in the 33-31 loss. Beckham caught seven of 11 targets for 60 yards against the Saints on Sunday. He also had one carry for 10 yards. Analysis: It wasn't much by Beckham's standards in part because Eli Manning was throwing mostly short passes. Beckham's usage is good, and he's too talented not to break a big play sooner or later. Beckham caught nine of 10 targets for 109 yards Sunday against the Texans. Analysis: His longest play was only 30 yards, but Beckham made some nice catches in traffic and used his elusiveness to steal extra yards. He looks completely healthy after last year's major injury. Beckham secured four of nine targets for 51 yards during Sunday's 20-13 loss to the Cowboys. Beckham caught 11 of 15 targets for 111 yards and lost one yard on one carry in Sunday's season-opening 20-15 loss to the Jaguars. Analysis: Beckham's surgically repaired ankle looks to be 100 percent healthy, as he turned in a strong showing despite facing one of the league's staunchest pass defenses, highlighted by elite cornerback Jalen Ramsey. Once he gets the opportunity to face some weaker defenses, expect Beckham to rack up the elite numbers owners came to expect of him prior to last year's ankle injury. Beckham has agreed to a five-year extension with the Giants, worth $95 million, Josina Anderson of ESPN reports. Analysis: Per the report, $65 million of Beckham's total haul is guaranteed, making him the highest-paid wideout in the NFL. With his long-term deal now in place, Beckham and Saquon Barkley are entrenched as franchise cornerstones for the Giants for the foreseeable future. Beckham and the Giants are said to be closing in on a five-year contract extension that would make him the highest-paid receiver in the NFL, Ian Rapoport of NFL Network reports. Analysis: With the Giants set to make a huge financial investment in Beckham, he'll presumably sit out the team's preseason finale against the Patriots. As he distances himself from last year's season-ending ankle injury, Beckham looks forward to starting the coming campaign in good health. Beckham didn't play in Friday's preseason game versus the Jets. Analysis: Beckham has been treated with kid gloves during exhibition season, which was the result of spending much of the offseason in recovery mode from surgery on his left ankle last October. He has otherwise been a full participant in practice, meaning he'll be looking to replicate the 90-1,300-10 (at least) lines from the first three years of his career. Coach Pat Shurmur said he isn't sure if Beckham will play in Friday's preseason game against the Jets, Jordan Raanan of ESPN.com reports. Analysis: Despite saying his star wideout is doing really well in practice, Shurmur couldn't promise an in-game appearance before the regular season. Coming back from last year's severe ankle injury, Beckham has made it through training camp without any limitations or setbacks. He should be fine to handle his usual heavy workload Week 1, regardless of playing or not playing in Friday's exhibition. Beckham did not play in Friday's preseason game against the Lions. Analysis: As expected, Beckham sat this one out alongside starting quarterback Eli Manning and rookie running back Saquon Barkley (hamstring). Look the receiver to make his preseason debut next Friday against the Jets. Beckham is not on track to play Friday night against the Lions, per Jordan Raanan of ESPN.com reports. Analysis: Beckham will probably see some action in the team's third preseason contest, but the Giants' priority right now is keeping their star wideout healthy. Beckham didn't make his 2017 regular-season debut until Week 2, courtesy of an ankle injury that he suffered during exhibition play. Beckham isn't expected to suit up for Thursday's preseason contest against the Browns, Josina Anderson of ESPN reports. Analysis: The Giants would be prudent if they opted to hold out Beckham for the entire exhibition schedule, but especially so against the opponent who initially caused his left ankle injury last preseason. Beckham will thus have two chances max to make an appearance this month -- Aug. 17 in Detroit and Aug. 24 versus the Jets -- because no Giants starters are expected to earn reps in preseason Week 4. Beckham (ankle) was a full participant at Thursday's practice, NJ.com's Matt Lombardo reports. Beckham (ankle) is expected to be a full participant in training camp, though Giants head coach Pat Shurmur did acknowledge the possibility of taking a more cautious approach with the star wideout, Ralph Vacchiano of SportsNet New York reports. Beckham (ankle) will report on time for the start of training camp, Kimberly Jones of NFL Network reports. Giants head coach Pat Shurmur said Thursday that there is "no reason to believe" Beckham (ankle) won't be a full participant in practices during training camp, Jordan Raanan of ESPN.com reports. Beckham (ankle) is expected to participate only in individual drills during the Giants' mandatory minicamp, NFL.com reports. Beckham (ankle) will be in attendance for the Giants' mandatory minicamp that begins Tuesday, Josina Anderson of ESPN reports. Beckham (ankle) is expected to rejoin the team for mandatory minicamp next week, and it's "possible" he could be fully cleared to participate, Ralph Vacchiano of SportsNet New York reports. Beckham (ankle) wasn't present at OTAs on Tuesday, but coach Pat Shurmur said that he's close to being physically cleared, Paul Schwartz of the New York Post reports. Beckham (ankle) was a limited participant at OTAs on Monday, Tom Rock of Newsday reports. 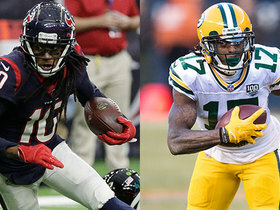 Beckham (ankle) will attend voluntary OTAs next week, Josina Anderson of ESPN reports. Beckham (ankle) was spotted on the field catching passes and taking part in non-contact individual drills during the Giants' minicamp practice Thursday, Jordan Raanan of ESPN.com reports. Coach Pat Shurmur relayed Tuesday that he "absolutely" expects Beckham (ankle) to remain with the Giants, the New York Daily News reports. Beckham (ankle) will participate in a walkthrough at voluntary minicamp Tuesday, but he won't be available to practice, Dianna Russini of ESPN reports. Beckham (ankle) was present at the Giants facility as of Tuesday, Albert Breer of TheMMQB.com reports. 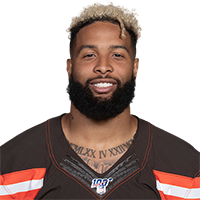 Beckham (ankle) reported to the Giants' team facility Monday morning for the beginning of the voluntary offseason workout program, Jordan Raanan of ESPN.com reports. Despite speculation about a holdout, Beckham (ankle) will attend the Giants' voluntary offseason workout program beginning Monday, Ralph Vacchiano of SportsNet New York reports. 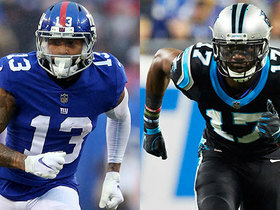 While he declined to make a definitive statement that Beckham (ankle) won't be traded, Giants general manger Dave Gettleman did say "you don't quit on talent" and was quick to mention the wideout's strong work ethic, ESPN.com's Dan Graziano reports. The Giants aren't actively shopping Beckham (ankle), but co-owner John Mara did suggest the team will at least listen to offers, ESPN.com's Jordan Raanan reports. Beckham (ankle) doesn't plan to begin practicing until he gets a new contract, Ian Rapoport of NFL Network reports. Beckham (ankle) suggested Saturday in a post on his personal Twitter account that he could sit out the Giants' preseason schedule, Jeremy Bergman of NFL.com reports. Beckham is happy with where he stands in his recovery from a fractured left ankle, Michael Eisen of the Giants' official site reports. "I don't know a percentage, but I'm actually doing really good," Beckham said Saturday at the NFL Honors awards show. "They tell me to slow down because I've been out for so long, and I'm ready to go, I'm ready to go. Now I can see where the mental part comes in as far as being patient, and knowing you can't push too much right now, or you need to push more. It's finding that balance." Beckham didn't have a walking boot on his right foot at the Giants' facility Wednesday, Ralph Vacchiano of SportsNet New York reports. Analysis: Perhaps unsurprisingly, a superior athlete is ahead of schedule in his recovery from a major surgery. Beckham worked out in the weight room Wednesday sans boot as he seeks to regain full mobility in his left ankle, according to Kimberly Jones of NFL Network. Once he achieves that step, Beckham will turn his focus to balance and strength. Considering where he stands, he should be running on all cylinders by the start of the offseason program in April. 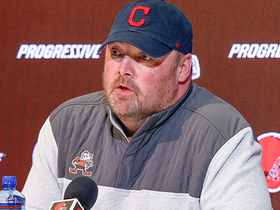 Cleveland Browns head coach Freddie Kitchens explains what wide receiver Odell Beckham Jr. brings to the Browns. 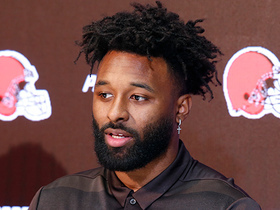 NFL Network Insider Ian Rapoport discusses why the San Francisco 49ers chose not to trade for Cleveland Browns wide receiver Odell Beckham Jr.
NFL Network's Reggie Wayne evaluates two teams' wide receiver additions this offseason. 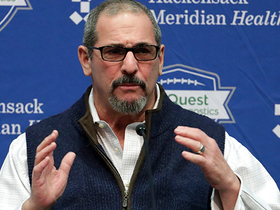 New York Giants general manager Dave Gettleman discusses why the team decided to trade away receiver Odell Beckham Jr. to the Cleveland Browns. 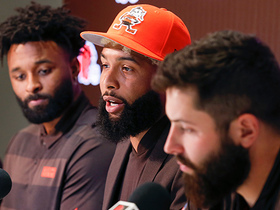 NFL Network's Kimberly Jones discusses that Cleveland Browns wide receiver Odell Beckham Jr. never wanted to leave New York.